The medal in honor of “Sorbonne/Abu Dhabi” bestowed on Pascal Renouard de Vallière. Disabled youth meet Lionel Richie. Al-Ahram International, Thursday, 29 March 2007, Article: “Incorruptible Men"
29 March 2007 - Download the article in PDF format. 21 December 2006 - Download the article in PDF format. National Assembly, 22 November 2006 - Download the article in PDF format. Article dated 25 October 2006 - Le Figaro - Download the article in PDF format. Interview of Gilles de Robien, Minister of National Education, Higher Education and Research, and Jean-Robert Pitte, President of Université Paris-Sorbonne (Paris IV). 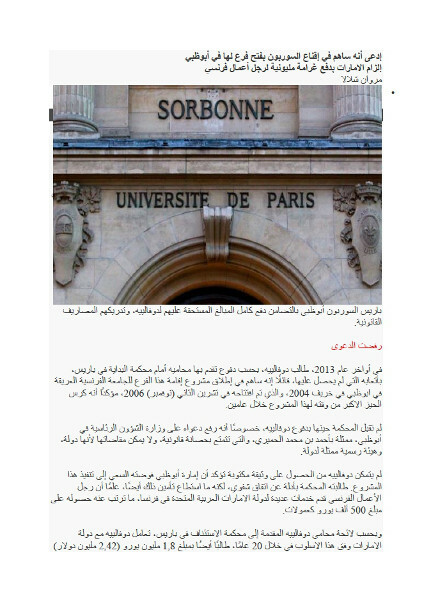 The Sorbonne is assuredly one of the most prestigious universities in the world. Founded in 1257 by Robert de Sorbon, Confessor to King Louis IX, this venerable institution has now extended to the Middle East 750 years after its creation. The new campus has opened in Abu Dhabi, the capital of the United Arab Emirates. To mark this historical event, the President of Université Paris-Sorbonne (Paris IV), Jean-Robert Pitte, agreed to an interview with “Message des Emirats”. Download the article in PDF format. January 2006, Le Message des Emirats, article by Pascal Renouard, Consultant in International Relations. Download the article in PDF format. July 2006, Valeurs Actuelles. The Paris IV unit in Abu Dhabi will welcome its first students for the upcoming fall semester. Download the article in PDF format. 18 May 2006, Al Ahram International. Download the article in PDF format. Second quarter 2006, La Lettre Diplomatique No. 74. Download the article in PDF format.